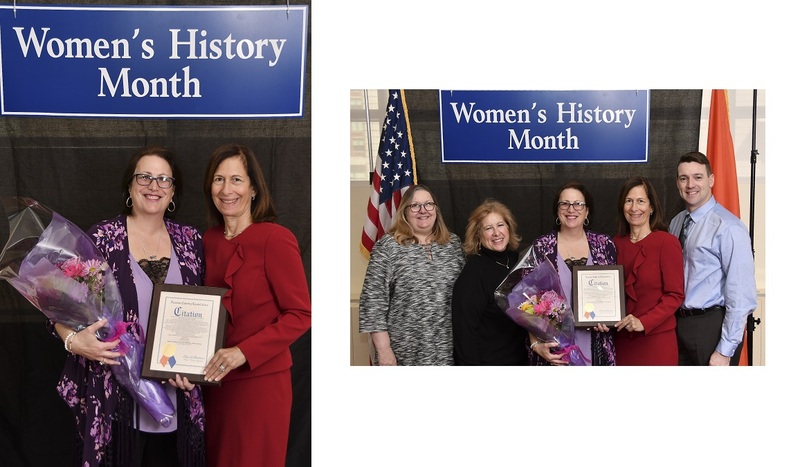 (MINEOLA, NY) – Nassau County Legislator Ellen W. Birnbaum (D-Great Neck) was delighted to honor Patty Katz on Monday, March 12, 2018 at the 20th Annual Trailblazers Awards Ceremony at the Nassau County Legislative Chamber in Mineola. As part of Women’s History Month, County Legislators honor outstanding women in their legislative districts who have “blazed trails” through the wonderful work they do in their communities. Patty Katz has been involved with environmental issues for years. Some of her achievements include working with former New York State Assemblywoman Michelle Schimel on Guilt Free Green, organizing a fundraiser for water wells in Maasai Mara, Kenya and conducting assembly programs in the Great Neck Schools on the effects of global warming. She is a Commissioner of the Great Neck Water Pollution Control District (GNWPCD) and has led a successful pharmaceutical take back program, Shed the Meds, at GNWPCD. Patty is the Vice President of Reach Out America and founder of its Green Committee. Patty is a singer/songwriter and member of the singing group The Steinettes who performed and co-wrote the music in director Robert Altman’s film Health and appeared in his movie Popeye. She also serves as the Director of the Great Neck branch of the Academy of European Arts and Culture. PHOTO CAPTION: Photo a: Great Neck Water Pollution Control District Commissioner Patty Katz and Legislator Ellen W. Birnbaum. Photo b: Sarah Prediger, Eileen Birns, Great Neck Water Pollution Control District Commissioner Patty Katz, Legislator Ellen W. Birnbaum and Great Neck Water Pollution Control District Superintendent Chris Murphy.